Nonprofit VSP Vision Care and AOR KCSA Strategic Communications recruited influential bloggers in key markets to compete in an EyeCare About Reading Book Drive Competition. Vision benefits and services nonprofit VSP Vision Care and long-time AOR KCSA Strategic Communications recruited three influential family-oriented bloggers in key markets last summer to compete in an EyeCare About Reading Book Drive Competition. “The goal was to engage local communities and VSP's Facebook following to collect books and to disseminate messaging about the importance of annual eye exams for children and the relationship between healthy vision, reading, and learning,” says agency VP Danielle DeVoren. Contestant bloggers in Atlanta, Houston, and Oklahoma City drove book donations to benefit a local charity of their choice. Jill Novelo, team leader of PR at VSP Global, notes there are large employer client bases in these cities and local outreach is particularly important during open-enrollment season. For every three books collected, VSP donated to the bloggers' chosen charity a gift certificate for a free eye exam and glasses with lenses from industry partner Transitions Optical. 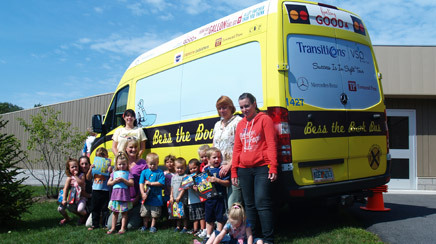 The blogger collecting the most books would win a visit from “Eyenstein,” VSP's mobile vision clinic, and “Bess the Book Bus,” a nonprofit mobile literacy program. Partnerships with children's book authors, media relations, and social media engagement also drove awareness and messaging. Bloggers Meghan Cooper of JaMonkey (Atlanta), Frederick Goodall of Mocha Dad (Houston), and Kara-Kae of The Mom Diggity (Oklahoma City) identified drop-off locations and promoted the book drive on their blogs and social networks during July and August. VSP provided reader giveaways, such as sunglasses, and signs for drop-off locations. Additional family-oriented bloggers, media in the blogger contestants' markets, and optical trades were pitched. Infographics were created and used by the contestant bloggers in pitches and on VSP's social media channels. Five children's book authors provided signed books for the bloggers to give away and for VSP to give away on Facebook and Twitter. The authors also participated in video Q&As that were featured on VSP's Facebook, Twitter, and YouTube properties. To broaden reach, VSP created an “Eyecare About Reading” Facebook tab where fans could click to pledge books. Transitions Optical donated the pledged books to Bess. For every three pledges, VSP donated a gift certificate and divided the total gift certificates among the contestant bloggers' chosen charities. Novelo says 2,858 books (nearly double the goal) and 953 gift certificates were donated. Twenty-four stories were placed across blogs, trades, and local media outlets such as NBC Atlanta's website. Twitter impressions exceeded 1 million and Facebook impressions hit 264,155. The Oklahoma City blogger won. The team is scheduling the visit from Eyenstein and Bess for next year and will promote it via local media outreach and social media engagement.